...and I finally decided it was time to get my own kitty. So last Saturday I hit up a local(ish) breeder/seller that had about 30 cats for sale. They had various breeds, including the kind of silver tabby that I had always wanted. I knew they had a beautiful Bengal too, but previous experience and research told me he was probably too crazy and too expensive so i resisted asking about him at first. - how much is that one? "ah - the mongolian cat?" I couldn't believe it! They didn't know it was a Bengal! Bear in mind this all takes place in China, where I live. Pedigree breeds are definitely 'a thing' here, amongst the inner-city newly-rich, but American and British shorthairs pretty much dominate the market so I guess this Bengal wasn't on their radar and either they were told he was Mongolian when they bought him, or they just said that because it sounded cool. and orangey around the neck and back. 2: I know Bengals can be destructive in their curiosity, and my apartment has a LOT of curio stuff that I have collected/acquired over the years, sitting out in the open on my shelves. But this Bengal was so beautiful that I decided to risk it. "Bengals are VERY vocal" - My Bengal is more vocal than my old chartreaux, but not as vocal as my old tabby. He will hassle me to clean his litter, feed him or play with him though. Which is kind of cool! "Bengals demand a clean litter tray" - True! He won't use it unless I clean it out. Can't be lazy here. Also, he wouldn't eat for the first couple of days, but that changed when I switched his plastic bowl for one of my ceramic breakfast bowls. "Bengals will pee outside of the litter tray" - So far this hasn't happened. I suspect it might happen if I didn't clean his litter out though. Spraying is another thing of course, and at 5 months my Bengal doesn't have this habit. I will get him spayed at 6 months. "Bengals are hyperactive and become destructive if bored" - He's no different to other young cats I have known in terms of his curiosity. He nibbles wires and corners of stuff, but hasn't caused any damage yet. He never bears his claws when I pick him up and pet him. He spends long periods chilling by me on the sofa (not on me, but snuggling up next to me). He loves to be stroked and rubbed around the chin and belly and he purrs a lot. He does like attention. When I get in from work, he invariably emerges from under my bed. I wonder if he rests there all day until I get back because there are never any signs of him romping around when I'm out. He's always excited to come say hi by rubbing himself on my legs when I arrive home. If he jumps up on the bed or sofa, I knock him over and he just falls against me and lays there on his side.. which is exactly what just happened! "Bengal cats are very intelligent" - Yes! He took two days to learn 'fetch the wand', he brings it right back to me on the sofa so it takes minimum effort from me and he loves it! He does also like to 'help' clean the litter tray, and he follows me from room to room, keenly observing whatever it is I'm doing. He likes to sleep next to me, but tends to wake up and run around a bit before sunrise. I've only had him a week so I'm not sure what he's like with other people yet. "Bengal cats love water" - I showered him on the first day, he hated it! He is not at all curious about the bathroom. "Bengal cats don't shed" - Yes, great! Overall, he's just a top pusscat. I'm so happy I found him, it was really unexpected. 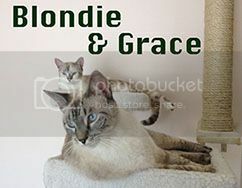 I have heard it so many times: breeds tend towards certain traits, but each cat itself represents a unique combination of variables. I feel so lucky that my Bengal appears to be relatively chill for his breed. That's my experience so far - how did your research/expectations compare to your Bengal experiences? Hey and welcome, I got my first Bengal 16 years ago so tbh I wasn't terribly sure what to expect at the time besides a very pretty and athletic cat and I admit she was a learning experience lol, there wasn't anywhere near as much information around then as there is now when it comes to getting one. I've had 3 bengals and I can say every single one has been different I have noticed at least with my two girls they are more lap cats than my boy is he's more like your boy from the sounds of it and will happily sit next to me whilst I do things unlike both my girls who demand attention and literally meow for cuddles. Water again is one that's down to the cat my first Bengal hated water, my boy likes playing in his water fountain and my little girl doesn't mind either way really. A lot of the destructive issues, marking and calling etc tend to happen post 6 months once they hit sexual maturity with males so you are better getting him neutered around now just to avoid any problems if he starts to spray it's a very hard habit to break with him. The same with males becoming territorial it tends to happen around sexual maturity. My boy is very athletic and playful and quite large so he tends to always be rushing around playing with his toys and chasing my little girl. On the day he was in for his neuter my little girl was happy just to snuggle up on my lap and sleep and cuddle me so I'm not really sure it being overly playful is in her nature or she just does it because he instigates things. Hopefully your little boy stays well behaved as long as you have him neutered before he hits sexual maturity and picks up those bad habits I believe he should stay a chilled out little guy. You had a Chartreaux! I would love to hear about that! I've heard of them but never seen one in-person. I believe they are very rare and special here in the States. "Bengals don't shed", that is just flat out not true, and really easily verifiable, so I'm a little baffled that anyone would make such a claim. 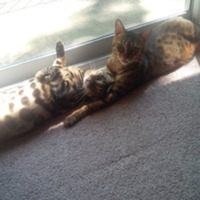 They don't shed very much, that is true, but when you've had your kitty for awhile, all you have to do is inspect his favorite sleeping spots and you'll find a very fine layer of bengal fur residue there. 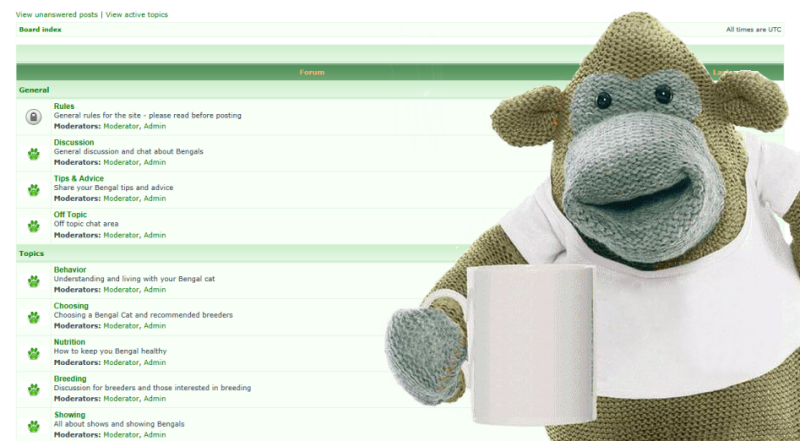 First of all, welcome to our forum! Secondly, congratulations on your beautiful bengal. Thirdly....JUST WAIT! GIVE IT MORE TIME! LOL. Just like children, bengals can be different depending on the particular cat. Any description and characteristics of the breed are going to go for the worst-case scenario! For example, my bengal is TOO VOCAL. He howls, he cries, he meows all the time (unless he is eating or sleeping) and will even cry while he is grooming or walking on his cat wheel. Just depends on the cat. Mine has never peed outside of his litter box. Bengals do have a lot of energy. I was working full time when I got Raiden and he has never destroyed anything. He does like to jump up on my makeup table and knock everything on the floor. It is true Bengals don't mind water, but many do not like showers! Mine will walk outside in the rain, put his paw in his bowl of water and lick his paw, but he has never jumped in the shower or bathtub with me. Glad you are having a wonderful experience with your baby! They are definitely a breed of their own. That takes me back to when my two were kittens. Nothing could keep them out of the tub or shower! I had just gotten a new tub with jets so I took a daily bath until the novelty wore off. As soon as I got into the tub they were dancing on the edges and diving in with me like it was a pool party! Showers were equally as much fun for them to watch from the ledge inside the curtain. They still play in the empty tub every day. Rain never bothers them, they get really wound up and come into the house to show me their wet fur and run outside again to play in the puddles. I have taken Blondie onto the top step of the pool but she hops right out. Grace takes her annual polar bear swim each February on the coldest day of the year. I have never understood why. Sounds like earlier, rather than later neutering is a good idea. He was lovely. Pretty much a skinny British blue, but not quite as slender as a Korat or Russian Blue. and then into adultood he became very loyal - if I was the only one around he would be so intimate, but around other people he was consistently withdrawn. He'd hiss at female visitors! such a surprise after being so purry with me.. He shed a lot, made me sneeze and I'd have to use those sticky roller things on soft surfaces. That's very sad. But he sounds like a neat cat. I'll bet that the hissing was actually *because* he was so "purry with you". He's saying "that's my human". Early neuter is definitely best. 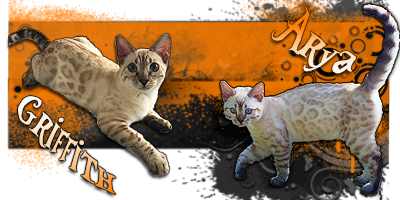 Many legit Bengal breeders don't release their kits until they have been neutered. My boy was cut at 10-11 weeks of age and has never had any of the common problems that arise with sexual maturity. Check with your local vets and see if you can find an early spay/neuter clinic. Here in China, there's a mobile vet that I can get to come over and do it at home for $50. He neutered my Chartreaux and did a clean job there, so I'll use him again. This weekend, hopefully. Mobile vets are great! We have several in my town, but I drag my bengal to the vet down the street! LOL. So I'm deep into week two now and he's certainly proving an extremely energetic cat. If I don't play with him, I get hassle by way of miaow and claw. Is that how you spell miaow? Anyway right now I'm curled up on the sofa and he's snuggled up all comfy next to me. Bengals are awesome! Here we spell it "meow." LOL. Yes, bengals are very energetic. They will wear you out and demand play time. If you don't use a toy, they will use you as one. Sounds like he has settled in wonderfully. My two Bengals have some similarities. 1. Neither of them is vocal. They meow here and there but they generally keep quiet. 2. They were active as kittens but the one who has become an adult is more sedate and sleeps a lot. 3. The adult one does pee outside the litter box. She just won't stop doing that despite my yelling at her and saying "no" or "bad kitty" when she does this. 4. Neither of them gets into water or the shower. 5. They are both intelligent. The older Bengal likes to play fetch, and she will run after and return to me a q-tip or piece of paper that I throw. We keep playing fetch multiple times. The younger Bengal plays regular games with me: she likes jumping up to the top of the refrigerator and chasing my fingers when I wave them on the sides of the refrigerator top. Catfriend, the litter box issue is a problem and yelling at a cat won't do any good. You must find the reason this is happening. Either it's the wrong type of litter box (open versus hooded), type of litter -- you may want to change that. Add another litter box to the mix and take a look around and see if anything has changed in the cat's environment. New outdoor cat in the area? More stress inside the home? If you can rule out something medical -- such as a urinary tract infection or crystals in the urine, then it's more than likely stress causing this. When you yell at the kitty, the kitty certainly doesn't want to use the litter box then. There is a lot of great information online. Google it. The older Bengal likes to play fetch, and she will run after and return to me a q-tip or piece of paper that I throw. We keep playing fetch multiple times. and we do an early morning fetch session. kitty ran out the room and fetched me a business card of someone that fixes computers and stuff!